While directly inheriting an IRA is perfectly fine for many heirs, it can be inappropriate in some situations. Under these circumstances, a trust may be able to help you control how your IRA assets are distributed after you're gone and help protect your family's wealth. Protect minor children: If you name minor children or grandchildren as beneficiaries without additional instructions, a guardian will likely be appointed by a court, which can be a complication and lengthy process and may reduce the benefit your heirs get from the inherited assets. Navigate blended family dynamics: For families with children from multiple marriages, a trust can help you make sure every member of your family inherits according to your wishes. Provide for children with special needs: If one of your beneficiaries has special needs, inheriting an IRA could jeopardize his or her ability to qualify for Social Security disability benefits or other forms of assistance. Avoid spendthrift tendencies: It's also worth considering whether you think your heirs can handle an inheritance responsibly once they reach adulthood. Young or spendthrift adults might be inclined to simply cash out the IRA and pay the taxes instead of taking advantage of deferred distributions. A trust can explicitly detail how much your heirs are able to receive each year and delay when they gain control over the assets. Protect family wealth from creditors: Trusts can also protect your family's wealth from divorce and bankruptcy. A 2014 Supreme Court case found that, unlike your own retirement accounts, an inherited IRA is not protected from creditors in the event of a bankruptcy. If you worry that your heirs might face divorce or bankruptcy proceedings, a trust might be worth considering. 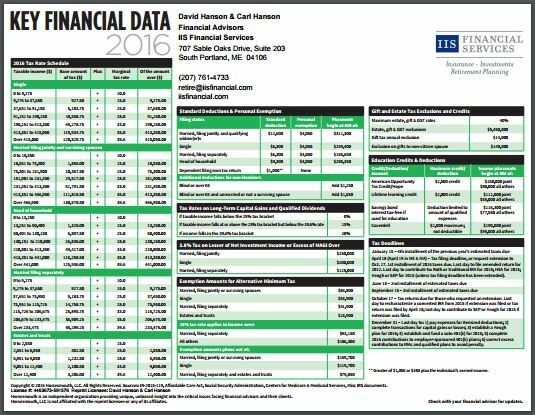 Click here or on the image to the right to download the client-approved 2016 Key Financial Data Chart. It gives you important Information investors need on taxes, social security, health care, medicare, retirement, college planning and more in 2016. Mistakes are easy to make: Trusts are very complex instruments that must be carefully worded to be able to accomplish your objectives. If the trust is not created to meet federal regulations, your heirs could lose most of the benefits of inheriting tax-advantaged IRA assets. For example, if the trust is not accepted as a "see-through" or "look-through" trust, the trustee may be forced to distribute the IRA's assets over a five-year period instead of stretching the distributions over a longer life expectancy. Simple mistakes like naming a charity as a trust beneficiary are enough to trigger expensive tax consequences for your heirs. Professional advice is critical: If you are going to name a trust as a beneficiary, it's critical to work with an attorney who understands your personal situation and has experience with trusts and inherited IRAs. We also recommend checking with your IRA custodian to make sure that trust provisions are compatible with the document governing your IRA. Simplicity is often best: Since trusts are complex and can be costly to create and maintain, they are often worth the trouble only if you have significant assets to protect or face a complex estate situation. In many cases, naming a spouse as primary beneficiary of your IRA and children as contingent beneficiaries is enough to preserve the tax benefits of your IRA for your heirs. Ultimately, choosing beneficiaries for your IRA is a task that is best accomplished with professional advice that coordinates all aspects of your estate strategies. Estate planning is a very complex area and it pays to get the details right. If you haven't reviewed your estate strategies recently or have questions about trusts, inherited IRAs, or beneficiary provisions, please give us a call. We have helped many of our clients explore their legacy goals and work closely with experienced attorneys and tax professionals who can help you identify the best solutions for your personal situation.